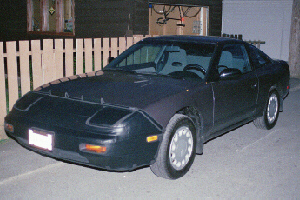 It's a charcoal (metallic) 240SX hatchback with Sport Package. No ABS, no spoiler, no A/C (nothing to rob precious power from the 140 horses). Vancouver, BC, 1989. Shortly after taking delivery. The strange glow is from taking the picture near sunset, with the aperture wide open and shutter speed slowed down. Night shot the same day in 1989. This picture was taken just after sunset, and there is still sufficient light from the sky to prevent the flash from spotlighting the car too much. 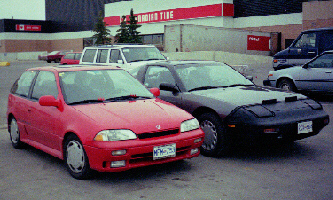 West Edmonton Mall with Tommy's Swift GT in May 1992. He now has a red '95 200/240SX Turbo. We made the drive from Vancouver, BC, to Edmonton, AB, pretty much non-stop. We even drove through snow in the mountain pass on summer tires. 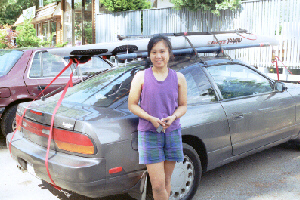 Elk Lake, Victoria, BC, 1997. 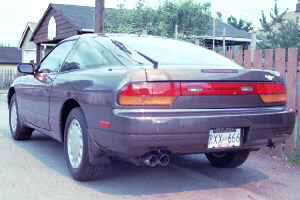 Aileen also has a red '90 240SX SE. On the roof is my 1993 Mistral Equipe longboard, mounted on a SportRack multi-purpose rack with watersports adaptors. The red straps are necessary to hold the board down during highway speeds. 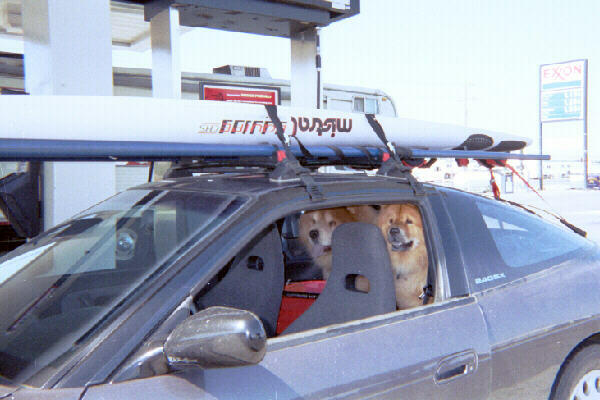 Ellensburg, WA, 1998. Gas stop on the way to a pig roast at Vantage, WA, on the Columbia River. L-R: Tyson and Mei-Sa are Chow-Chows that belong to my then-roommate Aaron. 1998 Methow Valley Mtn Bike Fest, Winthrop, WA. 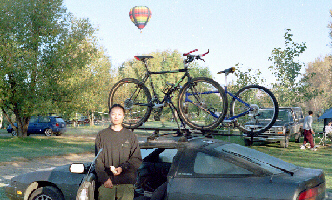 1993 Trek 970 rigid is mine, 1995 Kona Muni Mula is Mike's. He also has a black '93 240SX LE HICAS. Driver's view. 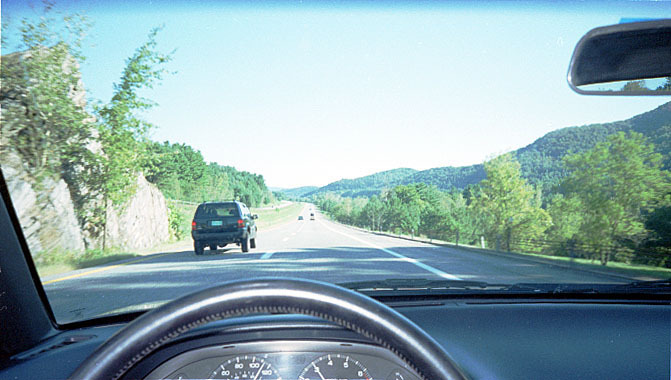 Southbound on Route 91 near White River Junction, VT, 1999. 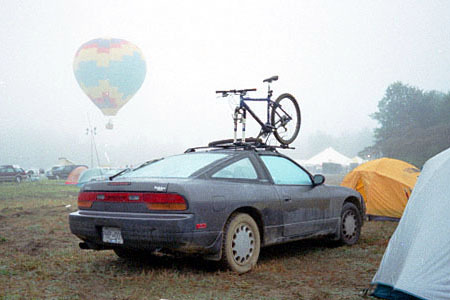 1999 New England Mtn Bike Fest, Randolf, VT. With my 1998 Specialized Stumpjumper Comp FS. My tent is on the right. Note the mud on the car and tires. It rained so hard the night before that the field turned into a swamp, and I was stuck at one point. Details and reliability history about my 240.